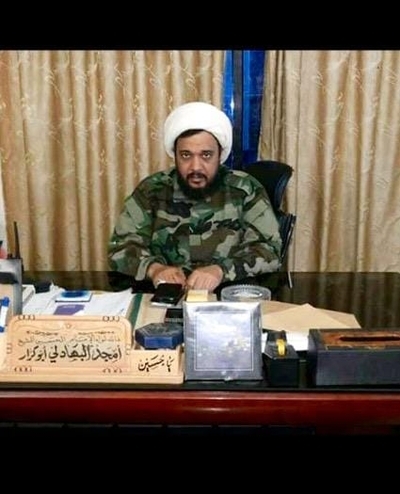 As noted in an earlier interview that I conducted, the Iraqi-led group Liwa al-Imam al-Hussein that is based in Syria was founded by one Sheikh Amjad al-Bahadali. In this post I will document some details about the life of Sheikh Amjad. Sheikh Amjad was originally from Sadr City in Baghdad. Prior to the fall of Saddam Hussein in 2003, Sheikh Amjad was a student of Ayatollah Muhammad Muhammad Sadiq al-Sadr, who was based inside Iraq and was the father of Muqtada al-Sadr. After the ayatollah's assassination in 1999, Sheikh Amjad became a follower of Muqtada al-Sadr. Following the U.S. invasion and beginning of its occupation of Iraq, he joined Muqtada al-Sadr's Jaysh al-Imam al-Mahdi, which fought against the U.S. presence in the country. Sheikh Amjad participated in many military engagements, including battles in al-Najaf al-Ashraf, al-Kufa, Sadr City and Latifiya (south of Baghdad). Indeed, he was a commander in Jaysh al-Imam al-Mahdi and was among those close to Muqtada al-Sadr (NB: here is an old photo of Sheikh Amjad praying behind Muqtada al-Sadr). On account of his role in Jaysh al-Imam al-Mahdi, Sheikh Amjad became wanted by the U.S. forces, which conducted search raids in attempts to arrest him. As a result, Sheikh Amjad migrated to Syria in 2007, where he became director of Muqtada al-Sadr's office in that country. As unrest broke out in Syria in 2011-2012, he was one of the supporters of the idea of the need to defend the Sayyida Zainab shrine in Damascus, and he had a role in setting up the original Liwa Abu al-Fadl al-Abbas and was among its commanders. However, in 2012 (even before the existence of Liwa Abu al-Fadl al-Abbas became more widely known in the media), Sheikh Amjad set up his own group: Liwa al-Imam al-Hussein. Sheikh Amjad was wounded in the battles of al-Mo'adhimiya and al-Mleha. Sheikh Amjad died in March 2017. There are conflicting accounts of his death: some hold that he died of a stroke, others that he was killed in fighting. In any case, following his death, his brother As'ad al-Bahadali became leader of Liwa al-Imam al-Hussein. 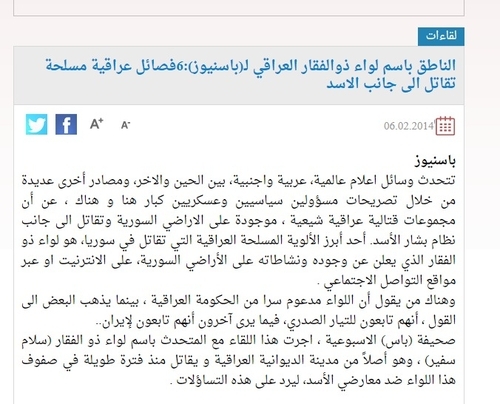 "LIH's spokesperson, in an interview with Iraq's Bas News, explained that members of the group formerly belonged to Jaish al-Mahdi and actually maintained links to AAH [Asa'ib Ahl al-Haq], not al-Sadr." In making this statement, Smyth misrepresents the source cited in more than one way. 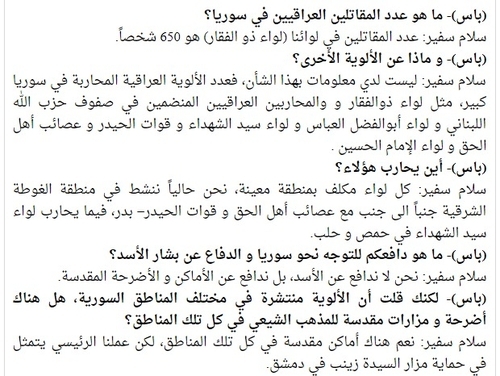 The source (endnote 115 in the paper) is an interview with one Salam al-Safir conducted by Bas News (incidentally, Smyth also gets the date of the source wrong: the interview was published on 6 February 2014, not 2 June 2014). The link provided in the paper is broken but the item can still be accessed via Wayback Machine. On accessing the item via Wayback Machine, one will find that the interview is not with LIH's spokesperson at all, but the spokesperson for Liwa Dhu al-Fiqar. 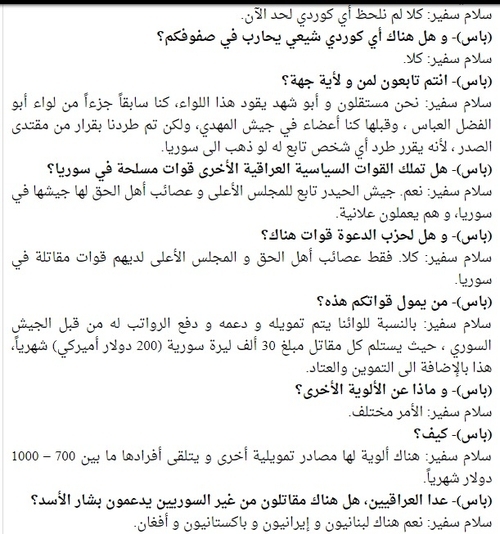 It is true Salam al-Safir worked with LIH at one point, but in speaking to Bas News (NB: Safir confirmed to me himself that he did this interview with Bas News), he was doing so as the spokesperson for Liwa Dhu al-Fiqar. Even the headline of the Bas News piece says: "The spokesperson for the Iraqi Liwa Dhu al-Fiqar..."
"We are independent and Abu Shahad leads this brigade. We were previously part of Liwa Abu al-Fadl al-Abbas, and before that we were members in Jaysh al-Mahdi, but we were expelled by a decision of Muqtada al-Sadr, because he decides to expel any person affiliated with him if that person goes to Syria." "We [Liwa Dhu al-Fiqar] are currently operating in the East Ghouta area side by side with Asa'ib Ahl al-Haq and Quwat Hayder- Badr." Thus, his point was that Liwa Dhu al-Fiqar was operating alongside AAH and Badr militarily in the East Ghouta region. For good measure, both Safir and a Liwa al-Imam al-Hussein official affirmed to me that Liwa al-Imam al-Hussein did not have origins in Asa'ib Ahl al-Haq. The latter source did note that there was a sniper from Asa'ib Ahl al-Haq in one of the contingents of Liwa al-Imam al-Hussein. "Liwa Dhulfiqar [Liwa Dhu al-Fiqar]'s commander has stated to the Iranian press that he too is pro-absolute velayat-e-faqih." Endnote 114 turns out to be an Ibid. follow-on to endnote 113, which is a March 2012 article from the Saudi-owned outlet al-Sharq al-Awsat about the split between Badr and the Supreme Islamic Council. No mention is made of Liwa Dhu al-Fiqar's commander or statements to the Iranian press about supporting velayat-e-faqih. In general, analyses of the Iraqi-led groups that were formed in Syria have not paid sufficient attention to the fact that their foundations lay in Iraqis who were already living in Syria before the unrest broke out. Noting this point can give better insight into their motivations for mobilizing to fight: namely, that they actually perceived there to be a threat to the Sayyida Zainab area and shrine. They did not need to be convinced by Iranian media and Hezbollah of this point: people who lived in the Sayyida Zainab area in 2011-2012 can tell you of how the security situation deteriorated. Moreover, these Iraqis were not ideologically monolithic: those identifying as Sadrists did not necessarily do so as part of a supposed Iranian disinformation campaign to market these groups as Sadrist (contrary to Smyth's conspiratorial thinking).